Dive in to redesigning your bathroom! The Tropical Fish Toilet Seat lets you transform the entire look of your space just by changing your toilet seat. Perfect for use in a nautical, beach or under-the-sea themed decorative design, the toilet seat has an ocean of colour and textures waiting to be explored. 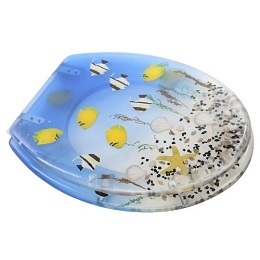 Black and white striped and solid yellow tropical fish appear to swim back and forth within the lid of the toilet seat. Beneath the school of fish, seashells, pebbles, a starfish and seaweed create an underwater forest that begs to be explored. The blue colouration of the tropical fish toilet seat makes you feel as if you're really looking into the sea and makes the seat vibrant and eye-catching. Constructed out of durable resin, the Tropical Fish Toilet Seat is handmade from start to finish, making it truly of unparalleled quality. The design includes round adjustable chrome-plated hinges that resist rust and simplify installation. The seat is backed by a 1-year warranty from the manufacturer, so you can add one to your home with confidence regarding its quality. The seat will work with most standard toilets, as its hinges adjust to accommodate fixing hole centres that are 105 millimetres to 205 millimetres apart.